A thicker, 3 ingredient Fruit Dip that will knock your socks off! It also makes a great lighter frosting for a cupcakes or a cake! I know I know… you’ve heard this before! But, in my humble opinion, this REALLY IS the BEST Fruit Dip EVER! It’s a little thicker and creamier than the traditional fruit dip, but that’s why I love it! This makes a perfect afters school snack, appetizer or the perfect addition to an upcoming summer BBQ! 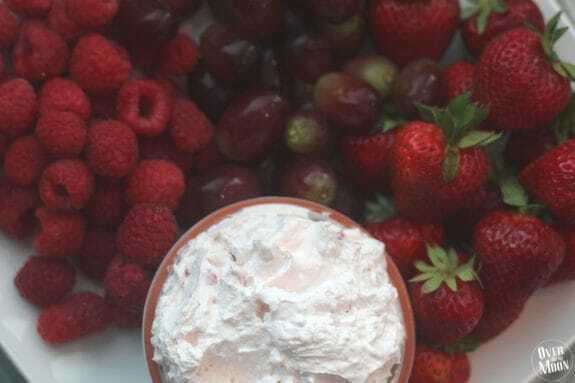 If you put out a plate of this fruit dip and some fruit, there is no way it won’t get devoured by your family or guests! I use this as a filling or frosting on several other desserts too! Specifically in this Strawberry Shortcake Cream Cheese Trifle! Here’s how you throw this quick dip together! Make sure your cream cheese is room temperature and soft. Take your cup of cut strawberries and use a food processor or even a fork and smash the strawberries to create a rough puree. 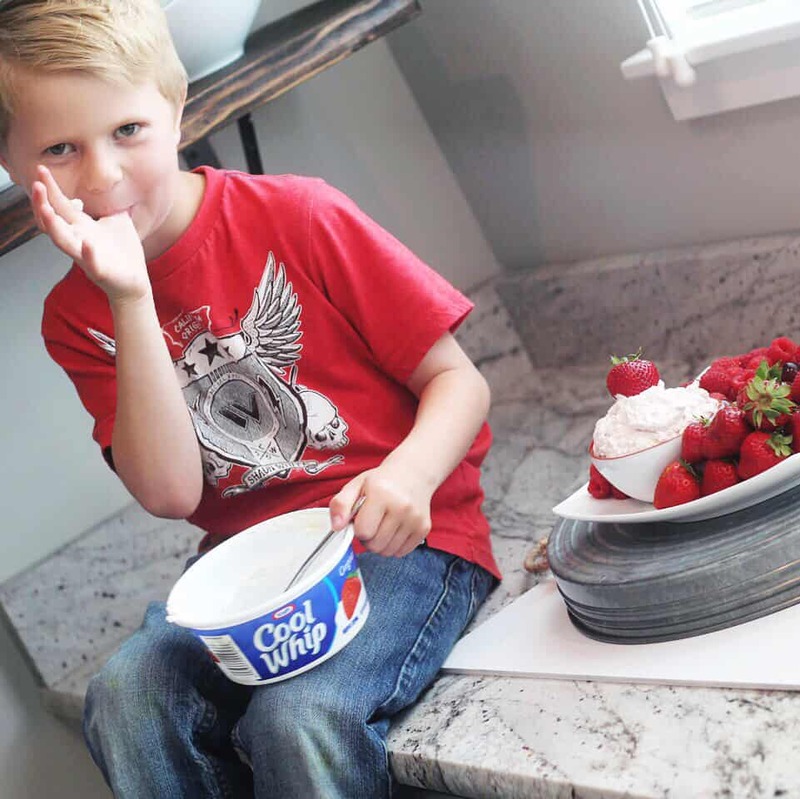 Combine Cool Whip, Cream Cheese, Sugar and Strawberries using a hand mixer. 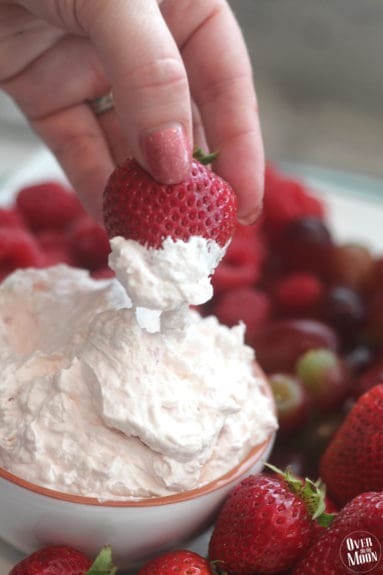 I like my fruit dip on the thicker side, so I use an 8oz Cool Whip. But, I've heard lots of people liking it better with the 12oz Cool Whip. I suggest buying the larger size and then mixing to your liking. Serve with fresh fruit and enjoy! My littles are literally obsessed with this dip! And they are wanting to eat it by the spoonful when I make it! 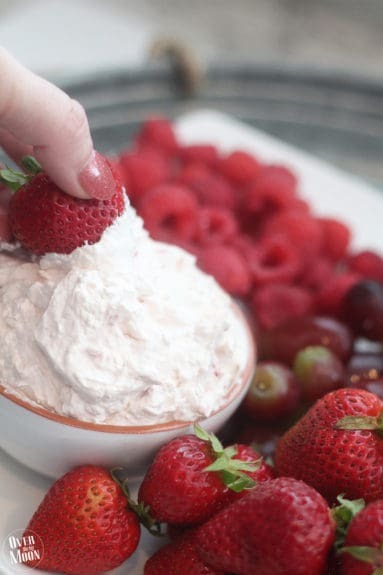 I hope you enjoy this yummy treat and have a summer filled with delicious fruit dip at every BBQ! hehe! Have a great day! If you love this post, then make sure and pin the image below! Fruit dip is a must-have at all of our parties. LOVE this recipe! I’ll eat ALL THE FRUIT with this fruit dip! YUM! 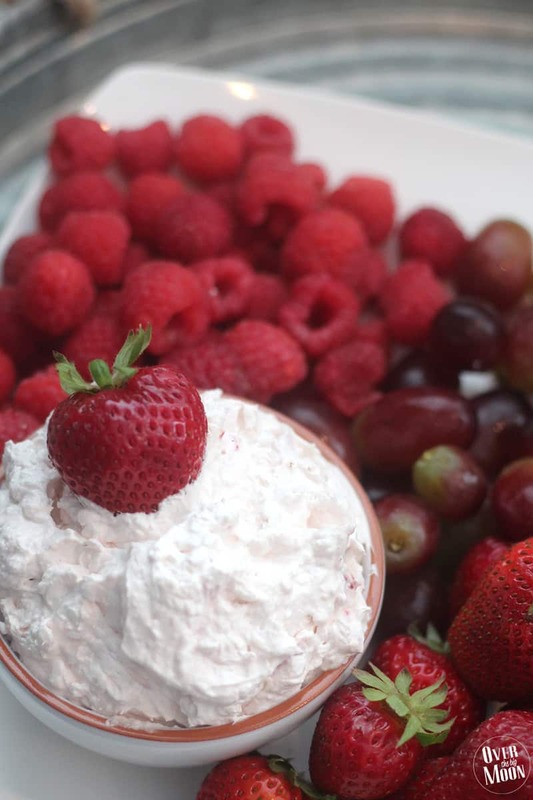 Nothing beats a good fruit dip – what a delicious recipe too! This stuff is seriously amazing! I love it any excuse I have to make it! How far in advance can this be made? This looks perfect for our guests this Thanksgiving for a treat! This could easily be made the day before and saved for Thanksgiving!! I made this for the 100th time this past weekend! Always a huge hit! 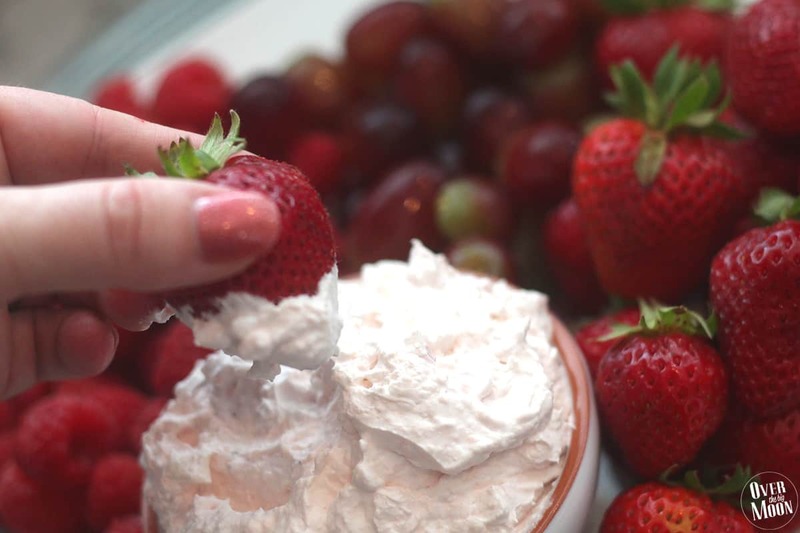 In having a grape cheese strawberry fruit tray would it be ok to omit the strawberry in the dip. Yes – you can totally omit the strawberry chunks! Is it ok to make this a day in advance? And thanks for the recipe, I’ll be making this for Mother’s Day! I do this but instead of sugar and strawberries I use chocolate pudding to make a chocolate fruit dip!!!! Yummy!! I have a similar version – it’s always a crowd pleasure! How can we make this dairy free? I’m honestly not sure, my home is a very strong dairy environment! I would suggest finding a dairy free fruit dip and then trying to mash up the strawberries and then adding them to it. Good luck! 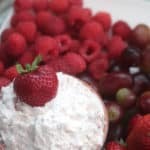 For my lactose free son I found dairy free cream cheese at one of my local grocery stores and you can make dream whip with lactose free milk or almond or coconut milk. What size container of cool whip ? Just a normal 8oz container! I used the large container of cool whip which worked great, not too sweet just right. What size container of coolwhip?